Hardneck with clove wrappers that appear to have a glazed, metallic sheen. 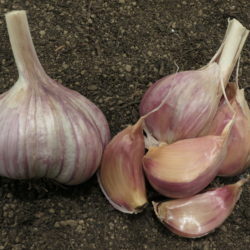 Clove skins are smooth and shiny with a purple blush. These are strongly bolting cultivars. They are excellent for eating raw and fabulous for roasting because of their exceptional sweetness. They have a very pleasant, lingering aftertaste.